A Best Practice Success Kit (below) contains easy-to-use resources to support uptake of the guideline at practice, education and policy, organization and system levels. A 8.5 x 10 poster, "Role Models are Vital"
eLearning course - The eLearning course below includes four modules, various learning activities (e.g. resources and reflection activities) a knowledge check and supplementary resources. 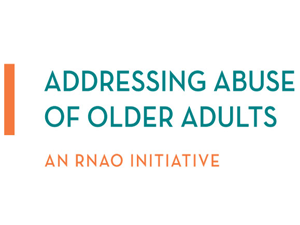 Select items are available to order at RNAO's Online Store. 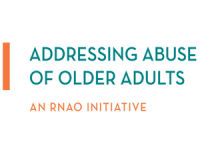 Background: The initiative builds on the success of a project entitled Promoting the Awareness of Elder Abuse in Long-Term Care, a RNAO and Canadian Nurses Association (CNA) collaborative, also funded by the Government of Canada's New Horizons for Seniors Program. This effort launched Prevention of Elder Abuse Centres of Excellence (PEACE) in 2010 in 10 long-term care homes across the country.